Tell Grandma you're going to be late for dinner and queue the Metallica because the Evil Insurgent Frame is out front like a Mustang with two chicks, honking the horn... Sporting a short chainstay, long top tube and 151mm of plush Delta suspension that combines to give you the best combination of all mountain versatility and loam roosting fun. If you're the All-Day Pedaler type, then outfit the Insurgent with a 150mm fork and set the Flip Chips to the LOW position -- the result is a 74.8° seat angle with a 66.1° head angle for equal parts party and control. More of the all-mountain, bike park, Enduro slayer? Slap on a 160mm fork with the Flip Chips in the XLOW position and you've got yourself a slack, corner crushing destroyer that's always keen to give 'er. 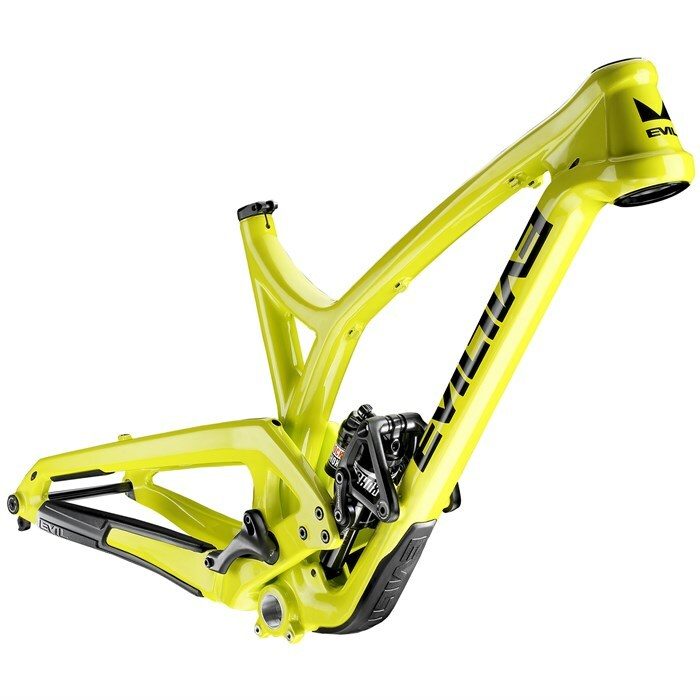 Internal Cable Routing  Internal routing for stealth dropper posts. Rear derailleur and brake routing is cleanly routed under the toptube and the rear derailleur cable is internally routed through the swingarm to keep things tidy. Delta Suspension System  The DELTA system was conceived to, among other things, achieve very complex leverage rate curves that can be used to tune for varying track conditions, spring, and damper parameters. Ultimately the design achieves a high degree of suppleness early in the travel, with a very predictable high traction stage through the middle and a bottomless ramp at the end of the travel. Flip Chip  At the heart of the Delta System is a simple chip that Evil calls the Flip Chip. At its most basic, the Flip Chip allows riders to change bottom bracket height and head angle by flipping the chip. This adjustment, like we said, leaves the leverage rate curve and orientation of the linkage unchanged. The slight offset in bearing bore creates a simple interface that allows the rider to personalize their ride. It's about finding what works for the way you ride and the terrain you ride in. RockShox Monarch Plus RC3 Debonair  Monarch Plus provides traction-gaining suppleness, giving you more control over any type of terrain – all in a lightweight bombproof package. Proven Rapid Recovery, DebonAir and Solo Air technologies come standard for this lightweight big hitter. Now with twice the rebound range, Monarch Plus allows you to take your riding to levels you never thought possible with a short and mid travel air shock. Integrated e13 Bashguard & Chainguide  Custom e13 lower guide and bash guard. Fully integrated carbon chainguide to keep that chain on. Custom ISCG05 Mounts  Custom ISCG05 tabs to accommodate Evil's lower guide collaboration with e13 components. Rubber Protection  Molded Rubber Downtube Protector keeps rocks and debris off the plastic and quiets the ride. Integrated rubber protection for the chainstay and seat stay to keep things peaceful and quiet in the woods. Bolt On Rear Axle  Evil's new axle bolts directly into the derailleur hanger for stiff hassle-free operation. Plastic Fantastic  Uni Directional Carbon with One Piece Molded construction from one of the best factories in the business. Sag Meter  Evil added a fancy integrated SAG meter into the non-drive side Delta Link to make suspension set up easy. Push it forward, sit on your bike, adjust air pressure to 30%, then shred.